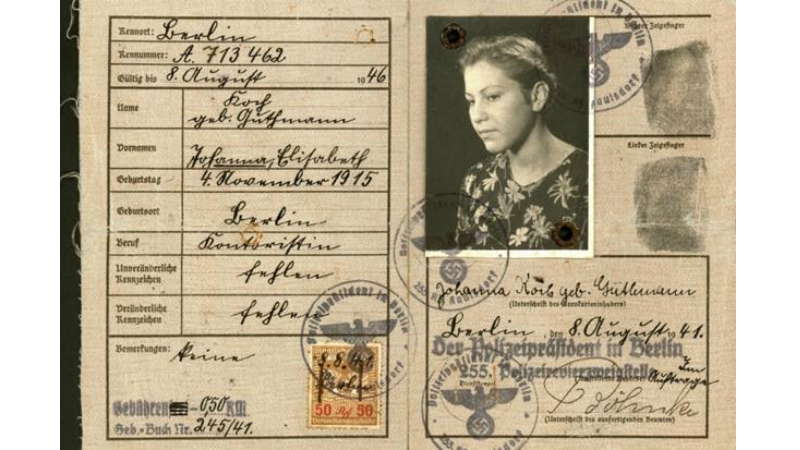 Marie Jalowicz Simon spent the Holocaust hiding from the Nazis—living underground in Berlin, keeping to the fringes of society, using an assumed name, dodging the authorities and anyone who might denounce her. She survived and went on to a postwar life as a university professor. It wasn’t until decades later, near the end of her life, that she sat down with her son Hermann Simon and a tape recorder and told her story. He edited everything, and the result is Underground in Berlin: A Young Woman’s Extraordinary Tale of Survival in the Heart of Nazi Germany. Translated into English by Anthea Bell, the book goes on sale in America today. This excerpt is taken from the prologue, 1942. It was freezing outside, and already dark. The bar was in Wassertorstrasse, part of the Kreuzberg district of Berlin where I had never been before. I entered the place, which was still entirely empty. Someone called “Hello?” from a back room. Looking through the open doorway, I saw a woman sitting there mending a fur coat. She seemed very reluctant to abandon this occupation and shuffle through to the front room to see me. Benno Heller had sent me here. He said I was to approach the only waitress in the bar, a woman called Felicitas. She was one of his patients. As a so-called “half-Jew,” she ought really to have been wearing the yellow star, but she was not. Heller, a gynecologist, had already found me a place to stay now and then, but this time he had warned me: Felicitas is something of a crook. He had not been happy about giving me her address, but he didn’t know anyone else who could help me. A sense of terrible dread surfaced in me, a deep fear: everything in my situation and in this part of the city was strange to me. All the same, I brought myself to tell Felicitas, in a few words, why I had come. She thought for a moment and then told me, in her thick Berlin accent, “I know what. The rubber director ought to be here soon, he’s always one of the first in the evening. He might be able to help.” Meanwhile, she told me to stand at the bar counter and act like any ordinary guest drinking a glass of beer. Soon the “rubber director” entered the bar. I was horrified. At a rough guess he was in his early fifties, and he walked with great difficulty. He moved as if his legs were made of rubber, and owed his nickname to his awkward gait and the fact that, as I learned later, he really was the director of a small company. His way of communicating was like his odd walk, a kind of verbal mishmash, and he brought out what he meant to say only after various failed attempts. In order to be understood, he kept saying the same thing over and over again, hoping to get it out more clearly. Yet again I felt terribly anxious. A woman doctor among my circle of acquaintances had once told me about patients in the late stages of syphilis to whom she gave psychiatric treatment. She said that they walked as if their legs were made of rubber, and they could no longer articulate properly. For instance, they didn’t say Topflappen [oven cloth] but Topfappen, and then corrected it to Opfappen — exactly as the man now before me spoke. I couldn’t hear what he and Felicitas were discussing, but afterwards I realized that she had sold me to him for fifteen marks. She wanted twenty, he offered ten, and they split the difference. Before I left the bar with him, Felicitas poured him another beer — he was a regular customer — and told me to go into the back room with her for a moment. There she told me the story she had served up to him: I was an old friend of hers, I had a husband at the front, and was living with my in-laws. My relationship with them, she told me, had become so unbearable that I had asked her to put me up somewhere, anywhere. She also confided, in an undertone, that Karl Galecki, the “rubber director,” was a Nazi whose fanaticism bordered on derangement. Then we set off. It was so icy cold outside that it took our breath away. He offered me his arm; we did not say a word to each other. The snow had frozen over and was glittering brightly. The moon was nearly full. I looked up at the sky: the Man in the Moon showed in gigantic proportions, a podgy face with a nasty grin. I felt desperately unhappy. Dogs can at least howl at the moon; I mustn’t even do that. Then I pulled myself together, thought of my parents and spoke to them silently in my mind. You needn’t worry about me, I told them, not in the least, your upbringing has left a deep impression on me. What I’m going through now has not the faintest influence on my mind or my development. I have to survive it, that’s all. The idea comforted me a little. The rubber director’s home was not far from the bar, but he had such severe difficulty in walking that we made slow progress. Finally, we were outside a large building, with an arched entrance leading to a yard. The long, hut-like structure where he lived stood there, and a little further off was a second hut which was his workplace. He stopped short. I was obviously the first person ever to have called him anything but “Galekki.” But how was it that I knew the right way to pronounce a Polish “c”? To explain that, I had to think up a lie quickly: a Herr Galecki used to live opposite us in my childhood, I said, a Pole who insisted on the proper pronunciation of his surname as “Galezki.” The rubber director promptly insisted on more information: could this man be a relation of his, what was his job? And so on and so forth. Then we went inside the hut. He lived here alone; his wife, he told me, stammering, had left him because she didn’t want to live with a cripple. He had spent years of his life in hospitals and sanatoriums. And now, living here, he indulged in the passion that helped him to endure his loneliness: his fish. The walls of the long room were covered to left and right by aquariums. Here and there a gap between them left room for a piece of furniture, but on the whole the place was devoted to fish. I asked him how many he had. There were far more than he could count by now, an astonishingly wide variety of species. Then he told me at length, and struggling again and again to get out the individual words, that he had his own fixed routine and wasn’t going to change it. I reacted with great understanding. “Why, of course you go to your regular bar every evening. We’re joining forces, but we won’t disturb one another,” I reassured him, adding, “And of course you’ll be eating your midday meal with your mother as usual.” We addressed each other by the informal du pronoun from the first, in the easy, spontaneous way of the bar-frequenting classes. His bed stood at the back of the long hut where he lived, among the aquariums, and there was a sofa at the front on which I was to sleep. He showed me where to find a blanket, pillows and sheets. Even without Felicitas, I would soon have realized that he was a fanatical Nazi. He proudly told me how, while he was in a sanatorium, he had made a matchstick model of Marienburg, dedicating it to the Führer. He asked me to guess how many matchsticks he had used. I guessed some very high figure, but of course it was nothing like high enough. He happily corrected me, and showed me a couple of newspaper cuttings praising this little miracle, with pictures of it. I praised it too. Towards the far end of this curious dwelling a picture frame hung on the wall, containing another frame, an empty passepartout consisting of two pieces of glass. Oh dear, I thought, maybe this was someone’s way of portraying a void, or some such nonsense. When the empty item was being framed, a hair must have got stuck in it. It lay at a slant on the surface, and showed an interesting play of color. “Any idea what that is?” he asked me, pointing at it. “No idea at all.” Even if I’d guessed, I would never have said so. Finally, he revealed the secret: he had acquired this item by complicated means and at some expense, as he told me, closing his eyes. It was a hair from the Führer’s German shepherd. Then he showed me the kitchen, and something that I hadn’t expected in this crazy aquarium: a side door leading to a proper, normal bathroom. After that we sat together for a while. I had become used to the strange jumble of words that he came up with, and I did not stare at him inquisitively, so he gradually cast off all inhibitions and gave his enthusiasm for Nazi ideology free rein. Nonetheless, I was terribly afraid of betraying myself. I could keep myself from saying the wrong thing, but I didn’t have all my physical reactions under control. For instance, he assured me that “the Ewes, the Yoose, the Jews must all die.” I felt myself flushing red, jumped up, pointed to one of the aquariums and said, “Oh, look, those fish are swimming in a different way now.” He clapped his hands in approval—I was a good observer of his darlings! I think God was reasonable himself, and saw my point. My improvised broche ran, “Praise be to you, king of the world, baure ha dogim, who made the fish.” I also addressed the fish directly in my mind. I am in mortal danger, abandoned by everyone, I told them. You are innocent creatures, just like me. Please intercede for me, you silent fish, when human beings abandon me. A little later, the rubber director announced, “There’s something I must tell you. This isn’t easy for me, so I will keep it short.” With bowed head and tears in his eyes, he said he was afraid he must disappoint me: he was no longer capable of any kind of sexual relationship. I tried to react in a neutral, friendly manner, but I was overcome by such relief and jubilation that I couldn’t sit still, and fled to the toilet. It was the most sublime and edifying visit to the toilet of my life. I conjured up in my mind Friday evening prayers as I had so often heard them in the Old Synagogue, of course in an abbreviated version. I call on you, dear choirboys, to sing, I thought, and made them sing as I remembered it. Everything served to thank God for saving me from deadly danger. I do not know, of course, just what Galecki really suffered from at the time, but I believed he was syphilitic, and if I had been obliged to share his bed I would indeed have felt myself to be in mortal danger. Once I knew that matters would not come to that, I felt deeply relieved, as if I had been set free. Hashem li welau iro—God is with me, I fear nothing, I recited silently before I returned to Galecki. The rubber director’s hut would really have been an ideal hiding place for me, if only the man hadn’t been such an incorrigible Nazi.